Deep Purple Gift Boxes 12x6x6"
3 x 3 x 3" 4 x 4 x 2" 4 x 4 x 4" 5 x 5 x 3" 6 x 4.5 x 4.5" 6 x 6 x 4" 6 x 6 x 6" 8 x 8 x 3.5" 9 x 4.5 x 4.5" 10 x 10 x 6" 10 x 5 x 4" 12 x 12 x 2.5" 12 x 6 x 6"
Deep Purple Gift Boxes 12x6x6" 100% Recycled Kraft Tint - 1 Pc Box Note: Product ships from separate warehouse via normal ground service, only to US destinations & cannot be expedited. Allow additional time for order processing and shipment. Make your packaging easy with these beautiful kraft boxes! These 100% recycled tinted kraft boxes have natural kraft interiors and are made in the USA. 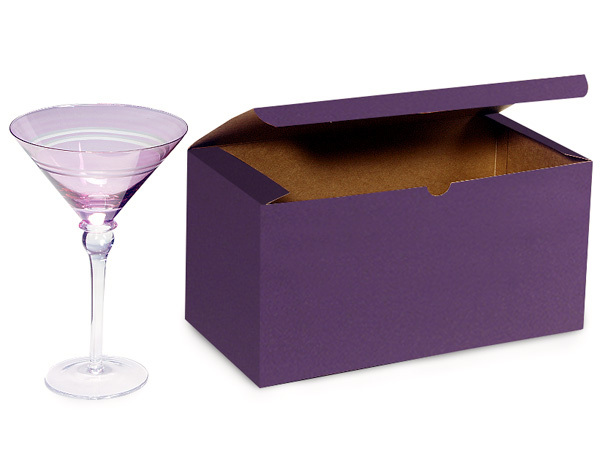 Boxes come in a variety of sizes and colors and have double lock bottoms with fold and tuck lids. Boxes fold flat for easy storage. All boxes have grooved pinstripe designs for a subtle upscale look. Use a food safe barrier like food grade tissue or cello for food packaging. Use a food safe barrier like food grade tissue or cello for food packaging.